Towards the end of the second century AD the pagan intellectual Celsus wrote an anti-Christian treatise mocking belief in Jesus Christ. If Jesus really had been the Son of God, he asked, why hadn’t God punished Pontius Pilate, the man responsible for crucifying him? Why had Pilate not been driven insane or torn apart, like the characters in Greek myths? Why had no calamity befallen him? While there are plenty of later Christian traditions about the punishment of Pontius Pilate, all of these seem to belong to a period long after Celsus was writing. Celsus’ challenge, and the response of early Christians to it, suggests that there was more than a kernel of truth in the claim that the Prefect of Judaea had evaded misfortune. This is implicit from the efforts early Christians made to absolve him of responsibility for the Crucifixion. The only reliable statement we have about Pilate’s life after his time in Judaea comes from the pen of the Jewish writer Josephus. In his Antiquities of the Jews, written about 60 years after the events, Josephus states that Pilate was recalled to Rome after his mishandling of a riot involving the Samaritans in AD 36. For this he would have expected to face a hearing before the Emperor Tiberius, the aged but uncompromising ruler who had appointed him ten years earlier. Pilate hurried back, but by the time he arrived, in March AD 37, the ailing Tiberius had died. A new emperor, Caligula, had taken up the reins of power. What happened next is guesswork. Josephus says nothing more about him, implying that there was no hearing. Perhaps, in the general euphoria surrounding Caligula’s accession, his case was put on hold, or simply forgotten. Maybe the hearing did go ahead and he was acquitted. For all we know, he was given another posting. The lack of a suitably grisly fate for Pilate put Christian apologists in a quandary. As governor, it was Pilate’s job to pass judgement in capital cases: he was the one who condemned Jesus to suffer on the cross. There was no circumventing his guilt. Divine punishment should have followed. Yet in the early years of Christianity it was difficult to make such claims. The Roman state was suspicious of the new cult and, if Christians wanted to avoid confrontation, it was best not to accuse one of Rome’s officials of deicide. 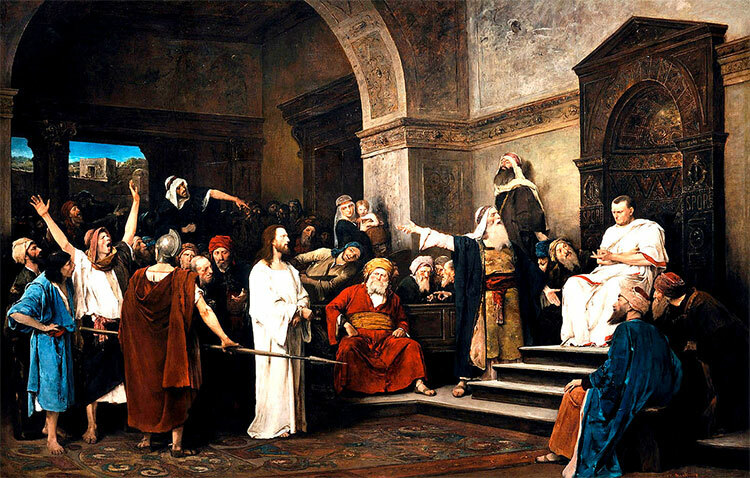 The canonical Gospels stressed that Pilate was not fully to blame. He could find no fault in Jesus: ‘I have found in him no grounds for the death penalty. Therefore I will have him punished and then release him’, Pilate declares in Luke’s Gospel. John has Pilate twice announce ‘I find no basis for a charge against him’. The apocryphal Gospel of Peter, thought by many scholars to be among the earliest Christian texts, went even further. In this, Pilate and his soldiers play no part in the crowd’s mocking or torturing of Jesus. He himself declares ‘I am pure from the blood of the Son of God’ and, together with his soldiers, who guard the tomb of Jesus, he conspires to keep the miracle of the Resurrection secret from the Jewish priests. The tradition of a blameless Pilate, a witness to the Passion, led to a strange early Christian fascination with him. By the second century AD, fake letters of Pilate, recounting the wondrous story of Jesus, circulated among the faithful. The so-called Acts of Pilate, allegedly deriving from the governor’s own records, portray Pilate as a convert. Tertullian, the late second-century Christian theologian, described Pilate as someone ‘who himself also in his own conscience was now a Christian’ and alleged that the Tiberius was so convinced by Pilate’s reports that he would have placed Jesus among the Roman gods had not the Senate refused. So influential were the various versions of the Acts of Pilate that in the early fourth century the Roman state created and promoted an anti-Christian, ‘true’, pagan version in an attempt to discredit the Christian ones. Needless to say this was no more reliable than its rivals. All of this might seem merely capricious, but the absolution of Pilate came at a terrible cost. The early Christians shifted the blame for the Crucifixion onto others. A rebuttal of the arguments of Celsus, written by the third-century bishop Origen, shows this clearly: ‘It was not so much Pilate that condemned Him,’ he wrote, ‘as the Jewish nation’. Celsus had chosen the wrong culprit; and the fact that the Jewish nation had been torn apart by the Romans and dispersed across the face of the earth was proof of God’s retribution. The fake letters and the Christian versions of the Acts of Pilate said much the same thing, as did other Christian apologists. The Acts went so far as to have the Jewish crowd telling Pilate that they willingly accept the blood-guilt, an echo of the Gospel of Matthew, which has the same crowd shouting ‘his blood be on us and our children!’ These claims formed a basis for Christian persecution of the Jews right up to modern times. Pilate’s costly absolution was the product of specific religious and political circumstances. When the Roman Empire became a Christian state in the fourth century, there was no longer any need to emphasise his innocence. The Nicene Creed, formulated under Emperor Constantine in AD 325 and emended in AD 381, stated bluntly that Christ ‘was crucified under Pontius Pilate’. It became acceptable to cast Pilate as a villain and a range of myths developed describing his grisly end. While the West went on to develop the tradition of a ‘bad’ Pilate who was punished for his misdeeds, the Eastern Church preferred a more sympathetic interpretation. Not only was Pilate a Christian; he was a confessor and even a martyr. One eastern text, The Handing Over of Pilate, has Tiberius ordering the governor to be beheaded for having allowed the Crucifixion to go ahead. First Pilate repents and then a voice from heaven proclaims that all nations will bless him, because under his governorship the prophecies about Christ were fulfilled. Finally an angel takes charge of his severed head. In some accounts he is buried with his wife and two children next to the tomb of Jesus – the ultimate martyr’s sepulchre. Those familiar with the western tradition may find the idea of St Pontius Pilate curious or even absurd. But the fascination with Pilate never abates. From the Acts of Pilate to Mikhail Bulgakov’s novel The Master and Margerita, the man who cross-examined and crucified Jesus remains an enigma, a shadowy metaphor for opposites: equivocation and stubbornness, cowardice and heroism, cruelty and clemency. His dilemma – to do the right thing or the popular thing – is every ruler’s quandary. Perhaps that is why people can sympathise with him: we too must sometimes face a difficult choice; though, fortunately for us, its legacy is likely to be less enduring. 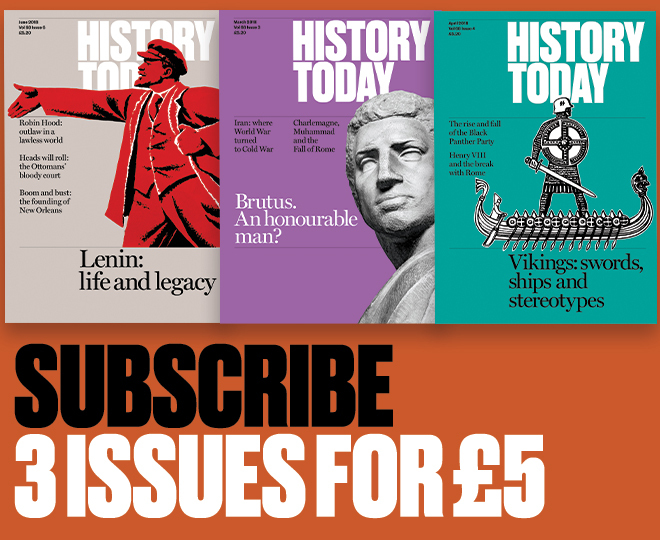 Kevin Butcher is Professor in the Department of Classics and Ancient History at the University of Warwick and the author of The Further Adventures of Pontius Pilate.